You've become a father and you're thrilled about having this baby in your life even though you are fatigued and nervous about figuring out how to raise this child. You were aware that this would be challenging, but at the same time you've hit an unexpected obstacle - something is not right with mom. You're not quite sure whether she's just having baby blues or it could be something else? Here's what you need to know. 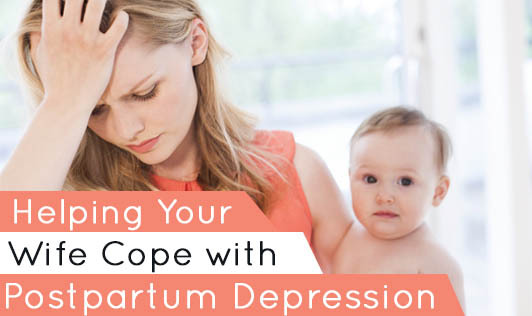 Postpartum depression can be serious and can sometimes be so severe that it leads to a break with reality. It affects about 2 or 3 of every 1000 births; generally begins in the first two weeks after childbirth. Women who have bipolar disorder or schizoaffective disorder are more susceptible to postpartum depression. Note: "A woman may not experience all of these symptoms. Some have only one or two and postpartum depression and anxiety are not one size fits all." Let her sleep at night: Your wife needs at least 5 hours of uninterrupted sleep every night in order to receive a full sleep cycle and restore her biorhythms. Just being there with her can make a huge difference: Letting her know that you support her is often all she'll need. Help her whenever you can: You can offer to change, bathe or dress the baby. Don't take it personally: You'll likely be the receiver of criticism about what you do or don't do. Don't take it personally and remember that whatever she says or thinks just comes out without thinking much about it. Start working with her right away to get professional help: Studies have shown that the sooner women who have postpartum depression or anxiety are treated, the less negative impact their illness will have on the family. Don't forget your own needs: If you're feeling frustrated that your partner isn't blissful about the new baby, that's normal. There are many people who know exactly what you are going through. Join an online support group where dads share their stories about how they got through postpartum depression with their wives. Help her get on a simple schedule: Help your wife get into a simple routine with a few tasks every day. A little bit of structure goes a long way. Accompany her to the doctor: Your wife may not be in a state to tell the doctor everything he or she will need to know. Hence, it's important that you communicate with the doctor and hear firsthand what he or she suggests to deal with the issue. If you notice any signs or symptoms of PPD in your wife, get in touch with your doctor!